Fields of Dreams // At her lush lavender farm, pianist lives vibrantly. True love and romance are just as much a part of the beauty at Camille’s Black Dog Lavender Farm, LLC in the heart of the Willamette Valley as is the mindful tending Pamela Celeste Weber and her husband Ron Bonham put into their rewarding lifestyle. “We love lavender,” Pamela says about the couple’s decision more than 10 years ago to purchase the farm in Halsey. Over time, they’ve transformed the grounds with a farmhouse dwelling, a state-of-the-art horse barn, rows and rows of fragrant lavender, and a cozy store from where Pamela sells her lavender specialties a few times a year. “We wanted to create something in our lives that’s romantic. Life can be so difficult sometimes. Our dream was to plant enough lavender, with fields wide enough between the rows that you could hold hands,” she says. The resulting splendor, luckily, is open to visitors on three Saturdays a year from late June to mid-July, the height of lavender’s short, breathtaking season. That undercurrent of satisfaction thrums through every aspect of life for Pamela as she embraces the daily rhythm on the farm. Beyond tending the generally hardy lavender plants with weeding and pruning, Pamela’s days are filled with producing an assortment of lavender products after the annual harvest is completed. Pamela grows and dries three kinds of lavender. ‘Hidcote Blue’, dark purple in color, stands out in her wreaths and other handmade crafts. ‘Provence’ lavender, primarily a culinary lavender, is used to make teas and is excellent for cooking and baking. Lavender is in the mint family, after all. For her distilled lavender oil (also sold online at www.camilleslavender.com), Pamela uses predominantly the oil from ‘Grosso’ lavender — the third variety she grows — but also adds a small percentage of the ‘Provence’ lavender’s oil for what Pamela calls a “celestial” combination. ‘Grosso’ lavender is a medicinal variety; its oil can be used to soothe burns and skin irritations, for example, as well as a natural mosquito repellent. ‘Grosso’ is good for cooking, too, Pamela explains, but it’s a stronger presence in foods than the ‘Provence’ lavender. When she plucks sample buds of both varieties for comparison, their scents are unique; the lighter ‘Provence’ is sweeter and more subtle. “All lavender smells like lavender, but each one is so different. It’s kind of like wine,” she explains. To stand among the rows of lavender behind the farm’s main house is a heady experience. It’s soothing. A stillness unfolds despite the regular buzzing of busy bees. Music drew Pamela and Ron together first. Living at the Oregon Coast in Newport, Pamela met Ron, a financial adviser for Wells Fargo Advisers in Eugene, when he was assisting her mother in financial planning. She suggested that Ron might sponsor a future benefit piano concert — her preferred way to perform. She has performed benefit piano concerts for the Oregon Council for the Arts and for the public library in Florence, among others. Ron eventually sponsored a concert she played in Newport. Their first date was at a Christmas party. They married 16 years ago. Playing piano for Pamela is a lifelong work. She began playing by ear at the early age of 3. “And then later in life, I really learned how to play,” she says. Upstairs in the couple’s farm-style home — downstairs is the production space for Pamela’s lavender works — the open, great room is spare but comfortable with elegant, antique furniture pieces that radiate character and simplicity. At the end of the room, on a dais of sorts, is Pamela’s grand piano, the round window behind it overlooking a ‘Provence’ lavender field. Pamela regularly practices, figuring out complex classical pieces — two of her favorite composers are Sergei Rachmaninoff and Franz Liszt — and then fine-tuning them, a process which intensifies ahead of a concert or a recording session. She has recorded a CD called “Longings for Home,” featuring preludes by composer Alexander Scriabin. When Pamela sits down to play Liszt’s “Au lac de Wallenstadt” by memory, she explains that it’s a piece the composer wrote for his mistress. “In the left hand you can hear still water; and in the right hand is the love song.” As she plays, the music is fluid and touching, beautifully filling the room. She admits that playing piano and tending lavender satisfy “completely different sides” of her personality. Downtime, then, is essential to Pamela, who spends most evenings with Ron in their barn enjoying their three horses, Bo, Isabel and Galitsiya, and their young, boisterous, black dog Oskar. Horses and dogs always have been special for Pamela and Ron, who don’t have children. Camille’s Black Dog Lavender Farm, LLC is named for their first mare, which the couple owned early in their marriage when they first had a farm in the coastal hills. They moved to the Halsey farm in 1999 when hillside living became too difficult for the aging horse. Camille died in 2007 and is buried on the farm. They’ve also lost Aicyr, a gelding, which died more recently of a heart attack. And they’ve lost Isolde, the black and white dog that graces the cover of Pamela’s CD. Behind the main house in the beautiful barn, where Pamela also dries her lavender on racks and stores home-grown hay in the upstairs loft, the three horses rotate from their spacious stalls to outdoor paddocks or an indoor ring, depending on the weather. Bo is the son of Camille and is mostly blind, but Pamela still rides him, along with Galitsiya, a mare they’ve owned since she was 6 months old. Isabel, a rescued Arabian horse, isn’t ridden, however, because she is a bit crippled from arthritis. On any given evening, then, Pamela and Ron most likely are in the barn together. “From 6 o’clock on, we rest and enjoy each other,” Pamela says, admitting that in the summer they could be in the barn until 9 or 10 at night. “I think maybe the lavender has helped us to learn that.” To enjoy the moment, that is. Lavender may only come for a short time, but all of it — Pamela’s piano, her loves, the farm — matters as a whole. Camille’s Black Dog Lavender Farm, LLC: 29680 Crook Drive, Halsey; 541-369-3693, www.camilleslavender.com. Open to the public on Saturday, July 7 and Saturday, July 14, 10 a.m. to 4 p.m. Pamela grows three kinds of lavender and produces lavender oil and other items for sale in her shop when the farm is open. 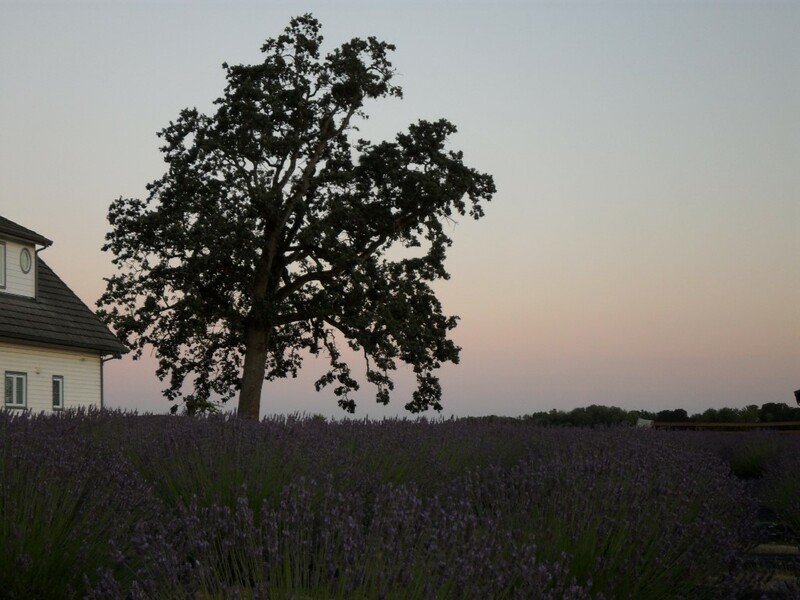 The Oregon Lavender Festival is Saturday, July 14 and Sunday, July 15, at various farms. Visit www.oregonlavenderdestinations.com for a list of tour participants and farm hours.